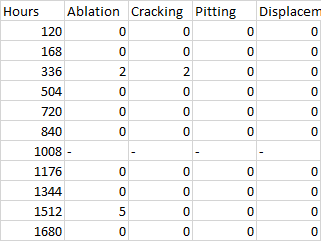 I have done a research looking at different frequencies of abrasions (ablation, etc.) over time (in hrs) and my data mainly consists of zeros. As I am weak in statistics, I am unsure which statistics, if any, is appropriate for my data. Attached is an example of my data. Originally, I had planned to do a regression analysis but I'm unsure if it will work, and all the other numbers that are not 0 were found to be outliers. Will zero-inflation be an option? Browse other questions tagged regression linear-model zero-inflation or ask your own question. Should you use Cronbach's alpha to calculate reliability on various measures of company patenting behavior? How to subset alternatives in nested multinomial logistic regression? What do the outputs of my zero inflated poisson model mean? Two Variables: CPTED Audit Rating and Crime Count-Which test to use?